An Arts in April event at Benessere Vineyards features the images of Geoff Hansen highlighting the seasons in the Napa Valley starting with a meet-and-greet reception with the photographer Saturday, April 6, from 11 to 3 p.m. at the winery, 1010 Big Tree Rd. in St. Helena. During the reception, Geoff will discuss his work and be offering complimentary portraits taken in the winery barrel room. Among those attending the Feb. 27 reception for the 'Savoring the Moment' were Marilyn and Lorne Glaim of Calistoga, left; NVPS members and participating artists Marissa Carlisle, center; Elizabeth Bush, back to camera, and Rick De Bernardi, back, chatting with Upper Valley Campus interim director Lissa Gibbs, right. St. Helena Star editor David Stoneberg puts his own camera to work at the Upper Valley Campus show. Conversing behind him are Nancy Hernandez, back to camera; George Bartolome, left; and NVPS founding member Priscilla Upton, center. Despite heavy rainstorms, flooding and the threat of more rain to come, NVPS members and friends braved the weather and made their way to the Upper Valley Campus of Napa Valley College for a Feb. 27 artists reception hosted by the college with appetizers prepared by students in the cooking school. The show of images by 20 NVPS members, 'Savoring the Moment', runs through June 10 at the campus, 1088 College Ave., St. Helena, and is free and open to the public. 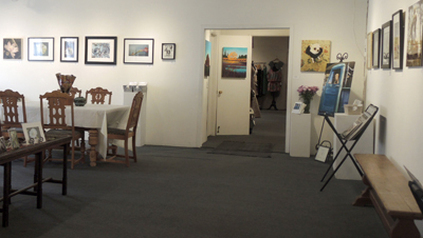 Gallery hours are Monday through Friday, 9 a.m. to 4 p.m. Details: 967-2901. Among NVPS member Geoff Hansen's photographs on exhibit are, from left, 'Clearing Spring Storm,' 'Sunflower Sundown in Napa Valley,' 'A Misty Bunch' -- digital images on metal. ​Geoff Hansen has a new exhibit of collected images, this time at Westin Verasa Napa on McKinstry Street. The three-month show also includes the watercolors of fellow Art Association Napa Valley member, Lis MacDonald. Photographer Elizabeth Bush chats with a fan during the '4 For Art' show at the CIA at Copia in November and December. NVPS member Chris Sauer is giving a show and a talk about his travels in Southeast Asia with his son, Luke. His presentation will be held the Napa Library, Thursday, Oct. 18, at 7 p.m. as part of the Library's 'Remarkable Journeys' program. NVPS member Wayne Lipps has an exhibit of his photos at the Napa County Library coming up with an opening reception at 7 p.m. Thursday, July 19. 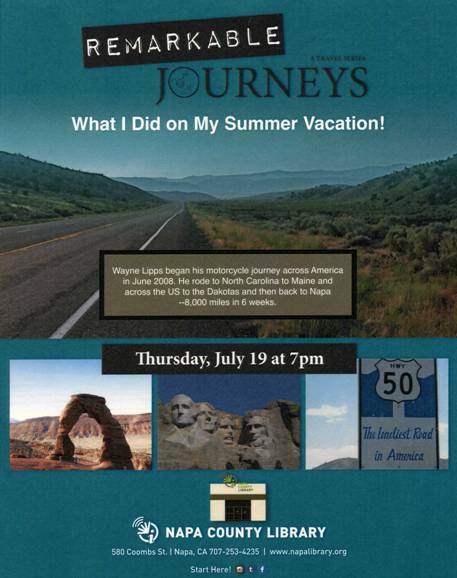 It’s part of the library’s "Remarkable Journeys" program and highlights his 8,000 mile motorcycle ride! Details below. An artists reception for Geoff Hansen will be held at the Stonehenge Winery Tasting Room, 1004 Clinton St, Napa Friday, Aug. 17, from 5 to 7 p.m. The exhibit, which opens officially July 5 and runs for three months, includes an eclectic array of Hansen's images. ​Follow photographer and NVPS member, Geoff Hansen’s pilgrimage through Napa Valley as he explores the beauty that each season brings. From pruning in the winter, bud break in Spring, véraison in Summer, to harvest in the Fall and everything in between, Geoff offers a visually stunning insight into a year in the Napa Valley at an ongoing exhibit at Benessere Vineyards, 1010 Big Ranch Rd. The exhibition will change from time to time, with new pieces added to maintain freshness. View his photographs at the winery, daily between 10 a.m. and 4 p.m. Tasting reservations are recommended. 'Locks' by NVPS member Phil Venable was part of a selection of his photos on display and for sale through November, 2017 at Rocklin Florist, 5885 Pacific St., Rocklin, northeast of Sacramento. ​NVPS member Betty Malmgren, a long-time local volunteer for Heifer International, was the featured photographer for October and November, 2017, at the Napa Senior Activity Center, 1500 Jefferson St.
At an opening reception hosted by the Senior Center Betty showed images taken during a 2015 trip to Honduras to see Heifer International projects in remote parts of the country. Women’s empowerment projects and environmental concerns were also be among the topics addressed. Additional local Heifer volunteers, who traveled in other countries such as Nepal and Lithuania, had displays at the reception. The show, thanks to ongoing efforts of George Bartolome, is hung in the center's entrance hallway where the images may be viewed at any time during business hours. 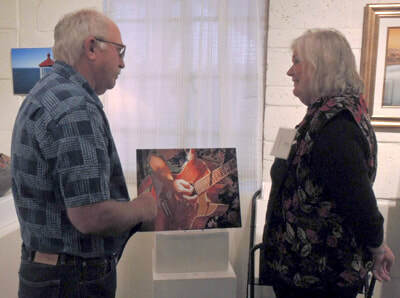 Gary Sampson discusses his first place winner, 'Lady Guitar,' with fellow NVPS member Ann Seronello. 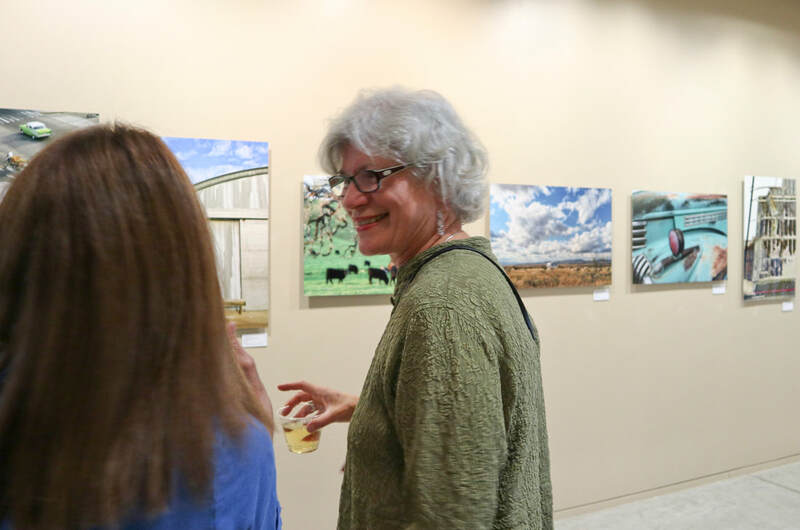 The October NVPS show at Jessel Gallery, “Photographers' Foto Favorites,” was spotlighted at an opening reception Oct. 6. Terry Smith, 'Omaha Koi,' second honorable mention; Nancy Hernandez, 'Senbazuru,' third honorable mention; Rebecca Maguire, 'Sunrise Landing.' fourth honorable mention. During the opening of the Napa Valley Photographc Society's September show at Greene's, Rick De Bernardi, left, chats with Joe Sinclair (adjusting his shades) as Joe Orsini, center, Geoff Hansen and Kathy Hansen enjoy an image of a Napa Valley landmark. Members of the Napa Valley Photographic Society, cameras in hand, were turned loose on the Valley this summer. Their mission: to photograph Napa Valley landmarks. Their challenge: to put an unusual spin on the familiar or the iconic. Seven ribbons were awarded. Winners included Geoff Hansen, first place for "Uptown Sundown;"
Marissa Carlisle, second-place award for "Old Adobe;"
George Bartolome, third place for "Veterans Home Memorial Chapel;"
Geoff Hansen, fourth place for "Milky Way Over Palms"
Gary Sampson for "Red Barn, Pope Valley;"
A new exhibit is up in the gallery of the downtown office of Vintage Wealth Advisors, 700 Main Street, Suite 305. 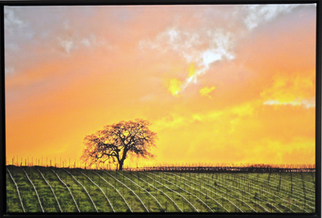 The show, under the auspices of the Napa Valley Art Association, features the images of NVPS member, Geoff Hansen. The exhibition runs through December. Some of the images on display at the Napa City Administration Building, First and School streets, reflecting recent events and changes in Napa. The rotating photography exhibit at City Hall shows the images of Napa -- a city in transition with many projects in the works. The new Archer Hotel on First Street, for example, is transforming the landscape of the downtown area and is one of the changes taking place. 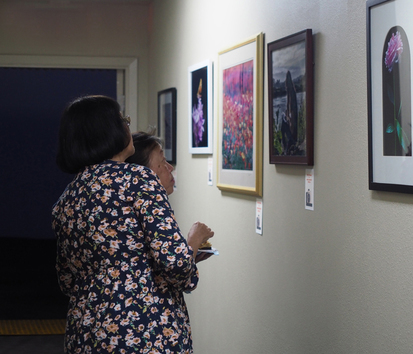 The photography in the current exhibit was provided by local photographers, Marissa Carlisle, ​Nancy Hernandez, George ​Bartolome and Gene Piscia. directed to Gene Piscia, 255-5342. ​NVPS member Carol Mills is the featured photographer in the main hall of the Napa Senior Activity Center, 1500 Jefferson St., through September. The exhibit features images captured during Carol's travels to India, and across the U.S. from Alaska to Arizona and the Hawaiian Islands. "Photography," she says, is "the perfect means for artistic expression, allowing me to mix my desire to be creative along with a penchant for the technical." 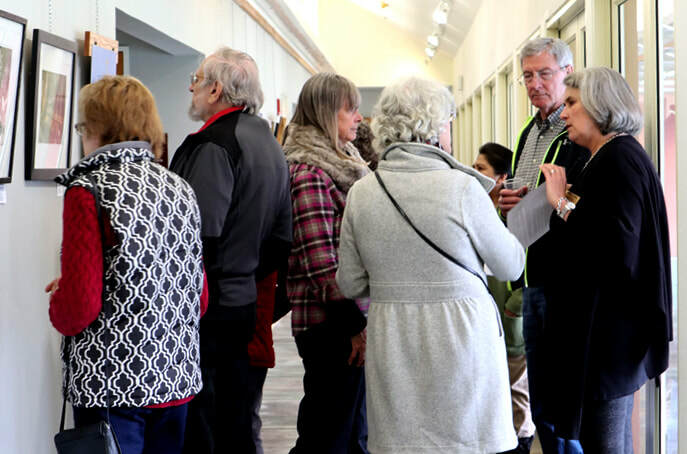 The Senior Activity Center, is open to the public from 8:30 a.m. to 4:30 p.m.
​Intriguing images, good food and a congenial crowd greeted latecomers to the November 9 opening reception of the NVPS members show in the gallery at Greene's Cleaners on Silverado Trail. The show, "Flora and Fauna of Napa Valley," featured a range of critters, from an elegant lizard to two fancy-dress chickens showing off their plumage, and flora that included lichen, iris, roses and camellias. 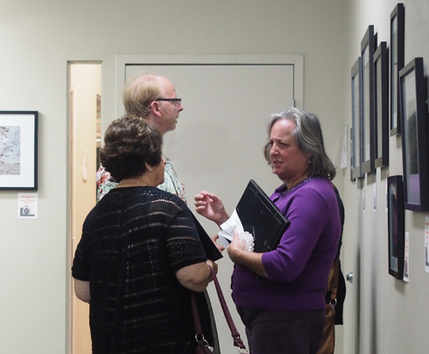 Award winner George Bertalotto, back left, admires a collection of images as another award winner Nancy Hernandez, left, converses with Lidia Bertalotto at the opening of the November NVPS members show at Greene's. Judging this year's array of images was Cheryl Bautista who has called Napa home for the last three years. She was bitten by the photography bug at a young age and in more recent years, has focused on landscapes and traveled to nearly every corner of California, the Grand Canyon, and has even given her a deeper appreciation of her own island roots, letting her enjoy every trip back to Hawaii through a photographer’s eye. The show continues through the end of November. Greene's photo gallery is open to the public Mondays through Fridays, 11 a.m. to 7 p.m., and Saturdays, 11 a.m. to 5 p.m. except on Thanksgiving day. 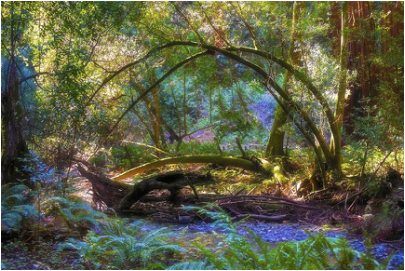 ​Congratulations to NVPS member Phil Venable's whose image, Enchanted Forest, was awarded third place at the Rocklin Fine Arts member show in early October. The recently sold photograph, released in September, is 18x24 inches and printed on metal. The gallery at Napa City Hall, School St.
Gene Piscia and his intrepid team of NVPS photographers -- George Bartolome, Nancy Hernandez and Marissa Carlisle -- recently installed the next in their series of themed exhibits on the north wall of the Napa City Hall lobby, 955 School St. between First and Second streets. The group got started several years ago when Gene was invited to brighten the walls of the main entrance. He, in turn, asked the trio to join him and in the years since they have mounted a new exhibit quarterly. Some past themes have featured the county's Literacy Program as well as Wildlife Rescue, People & Places, and Napa Entrepreneurs and Chefs. The current collection has a "Floral" theme. City Hall is open from 8 a.m. to 5 p.m.
"Heart, Humor and Beauty, was the theme of this year's month-long juried show in October at Jessel Gallery on Atlas Peak Road. Jurors Included NVPS boardmember Lanny Johnson, as well as Laurie Corona, local business owner and Paul Hippauf, Paul Hippauf Photography. This year at the annual members show first, second, third and fourth place awards as well as honorable mentions were selected by local photographer, author and retired Napa dentist, Dr. Adrian Fenderson. ​Award winners included: First place, Tim Byer, "Sky Ablaze;" second place, Tim Byer, "Beached;" third place, Joseph Sinclair, "Streamside;" and fourth place, Connie Reid, "Coastal Sunrise." In addition, Irena Miles' "Tiffany Dome," and Elizabeth Bush's "Sam's Place," each earned first honorable mention. Second honorable mentions went to Joseph Sinclair, "Woman in the Tree," and Jessel Miller's, "Let Bubba Do the Driving." Natalie Syverson's, "I Will Grow With You," earned third honorable mention. Seated at left, Mary Elizabeth Eberhardt-Sandstrom, Bank of Stockton vice president and director of community banking, chats with Napa branch staff members, Deana Stutting, center, and Lucia Morasci, right, during the opening reception. Eberhardt-Sandstrom, a member of the bank's founding family, came from Stockton to attend the event. 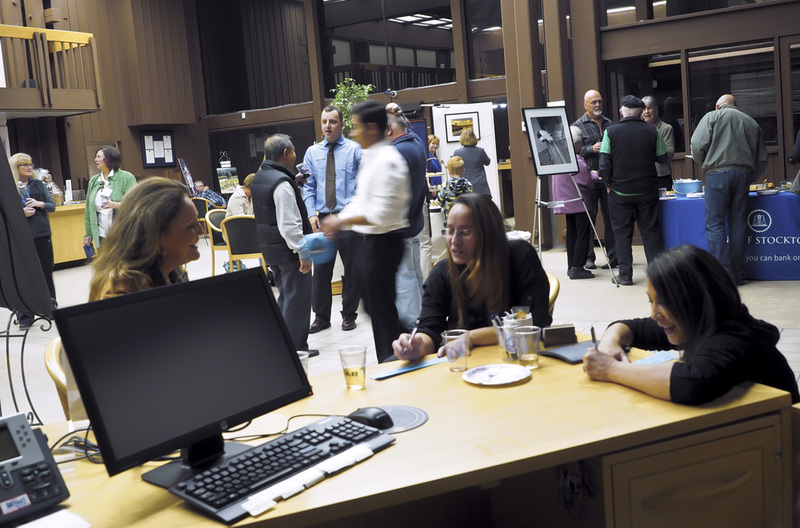 Conversation was lively and the hors d'oeuvres and wine plentiful at the Nov. 12 artist reception for the Napa Valley Photographic Society exhibit, "People and Places of Bank of Stockton." Held at the bank's recently opened branch on Second Street, the opening was attended by more than 70 guests. The bank staff was especially enthusiastic and generous with their time, said NVPS exhibit chair Terry Smith, noting that they sent personal invitations to bank dignitaries and hand delivered printed invitations to local business people, clients and city administrators. The exhibit's theme includes the sights and sites of both Stockton and Napa as well as photographs of bank staff and clients of the bank's Napa branch. Athough new to Napa, the bank has been a fixture in Stockton since 1867. The exhibit ran through Nov. 30. Early attendees at the the Oct. 2 artists reception for the annual NVPS members show at Jessel Gallery, "Reality Meets Imagination," included, from left, gallery owner Jessel Miller, Elizabeth Bush, exhibit chair Terry Smith, back to camera, talking with David Reichel, Carol Mills, Mark Mattioli, Lorenzo Mills, partially hidden next to Marissa Carlisle, and Pam Venable. 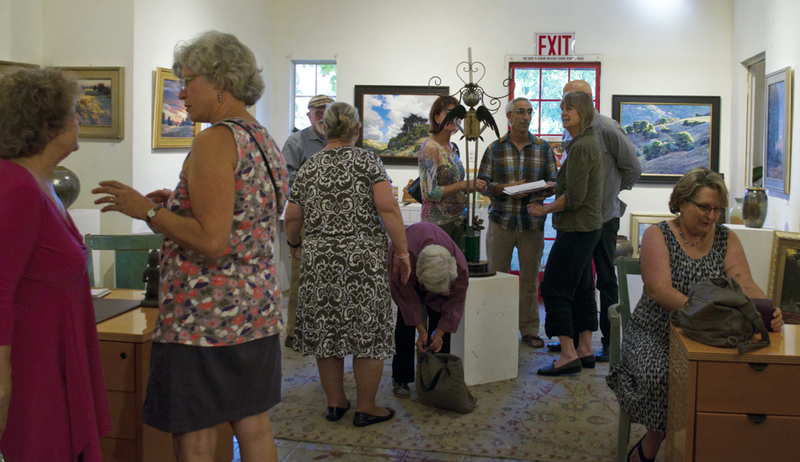 In all, 85 visitors attended the opening of the juried show. McCoy's photographs were displayed at Studio 15 in the Wine Train Commissary Building, 801 8th St., Napa. To see more of McCoy's photographs visit www.PamMcCoyPhotography.com. ​Reid exhibited her work at Studio 10, 437 Adams St., between Pine and Laurel streets in Old Town Napa. More of Reid's fine art photography can be viewed at www.constancereid.com. A Calistoga contingent, Don Palmer and Linda Williamson, discuss photography with a new NVPS member, Michael Gan. The back halls of Greene's Cleaners were alive with conversation Sept. 1 when more than 62 visitors arrived to view the opening night exhibit of photographs, "Taken With A _____ (iPhone, GoPro, Critter Cam, Drone, etc. 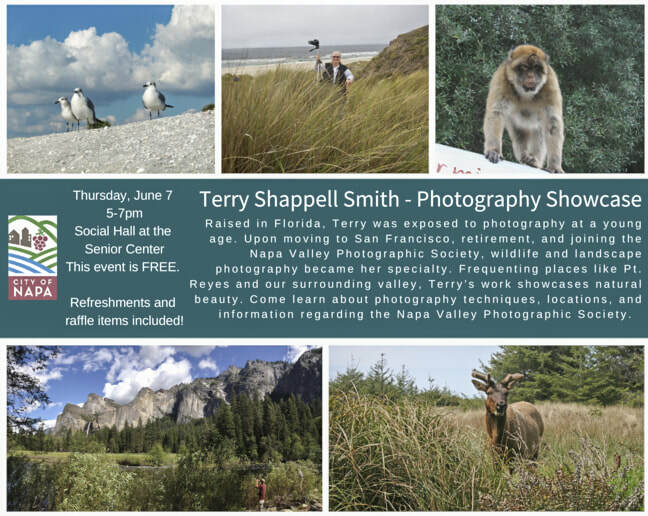 )," enjoyed food and drink, and took advantage of a chance to talk with fellow photographers. Exhibit Chair Terry Smith organized the event with help from NVPS members and others: Suzanne and Bob Conner, Carolyn Younger, Kathryne Bandrowski, Betty Malmgren, Marissa Carlisle and Nick Orndorff. Before the show Betty, Carolyn and Phil Venable acted as mentors for first-time exhibitors. For those who didn't have a chance to enter this first of three exhibits, another opportunity is coming in October. 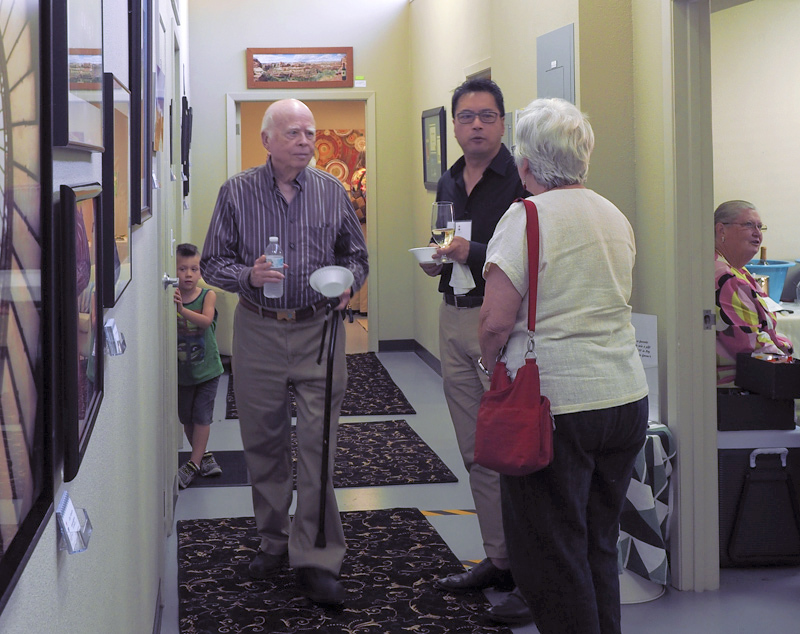 The club's annual show was held the folowing month at Jessel Gallery. The theme of the juried exhibit was "Reality Meets Imagination." The Greene's photo gallery is open to the public Mondays through Fridays, 11 a.m. to 7 p.m., and Saturdays, 11 a.m. to 5 p.m.
Are you having a gallery showing or exhibition of your work? This space is reserved for you.